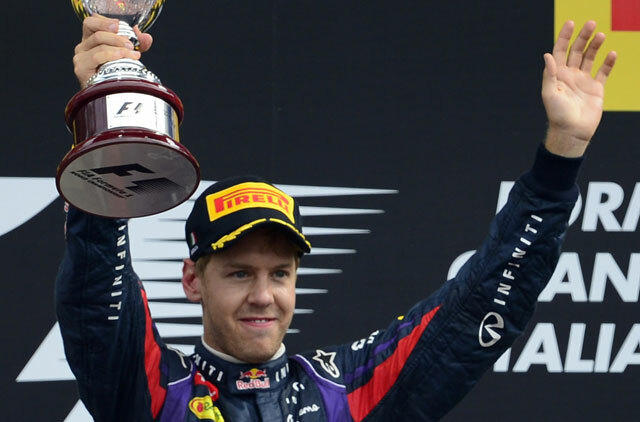 Monza, Italy: Sebastian Vettel extended his lead in the drivers’ world championship to more than 50 points when he drove to a polished victory for Red Bull in Sunday’s Italian Grand Prix. The 26-year-old German, series leader and defending triple world champion, survived a torrid start and gearbox problems as he dominated an intriguing 53-lap race, the last of the European part of the Formula One season. On a warm, if overcast, afternoon, Vettel proved both his sublime talent and his fighting spirit — as both Red Bull drivers were told to nurse their cars home — to reel off his sixth win of the season and the 32nd of his career. It was his third win at Monza and helped Red Bull end a run of poor results at the circuit. His performance, however, was matched by that of Briton Lewis Hamilton, who started 12th, lost the use of his team radio and suffered a slow puncture, as he fought back twice to finish ninth. “A nightmare,” he said. Germany’s Nico Hulkenberg, who had qualified with a stunning third in his Ferrari-powered Sauber, came home an excellent fifth to endorse his claims as a possible successor to Massa next season. Hamilton did his utmost to pass Grosjean on the final lap, but in the end had to settle for ninth ahead of fellow Briton and former teammate Jenson Button of McLaren, who were this weekend celebrating their 50th anniversary as an F1 team. In the title race, with seven ‘flyaway’ races outside Europe remaining, Vettel leads with 222 points ahead of Alonso on 169 and Hamilton on 141. At the start, Vettel struggled to establish himself as leader from the 40th pole of his career, surviving a clattering challenge through the first chicane to emerge ahead of Massa’s Ferrari, the Brazilian having surged past Webber. In a furious opening, Briton Paul Di Resta was forced to retire his Force India after locking up the front of his car and colliding with Romain Grosjean’s Lotus. Hamilton, from 12th, rose to 10th before his problems began with the loss of radio contact. Running on the harder compound tyres, he then picked up a slow right front puncture and was forced — with the aid of old-school pit board signals — to pit, rejoining 19th after 14 laps. His lead was cut to 4.8 before he pitted after 23 laps, emerging third behind Alonso and Rosberg as the Spaniard responded to his team’s call to push hard.